The NHS and leading burns surgeons are today issuing new first aid guidance to help ensure victims of acid attacks get the right help fast. The assistance for victims comes as new data from NHS England show the number of people requiring specialist medical help for this type of assault is on the rise. In 2014, 16 people required specialist medical advice, rising to 25 in 2015 and increasing further to 32 last year. The level of demand for specialist burns help so far in 2017 suggests there will be another rise in patient numbers this year. So-called ‘acid attacks’, where corrosive substances are used as part of a violent assault or robbery, have become increasingly prominent, with a series of high-profile incidents this year. As well as the significant harm caused to individuals, the NHS estimates that the average cost of care for a victim requiring specialist burns treatment, eye care, rehabilitation and mental health treatment is £34,500. 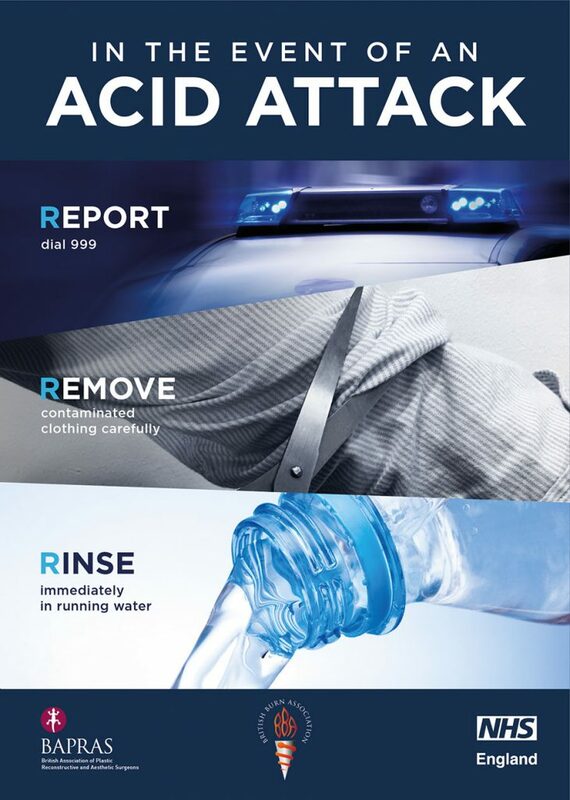 NHS England, in partnership with the British Association of Plastic, Reconstructive and Aesthetic Surgeons (BAPRAS) is today publishing new advice for anyone falling victim to acid attacks, including new online guidance and support to victims as well as friends or family of people affected by burns. The guidance – Report, Remove, Rinse – has been developed with specialist BAPRAS burns and trauma surgeons, who have treated victims of these attacks. A burns unit serving patients from London and the South East, has seen a substantial increase in the number of people it has helped this year who have been affected by this type of assault. In 2016 the St Andrew’s Burns Centre saw 20 people who required admission because of the most serious effects of acid or corrosive burns, a similar number who were treated there over the previous 15 years. The Centre is on course to deliver help to over 30 people in 2017. People assaulted with corrosive substances like acid are likely to need a range of different care after the emergency response. This could include therapy, specialist burns treatment, and in some instances eye or plastic and reconstructive surgery. This new guidance for victims published today is designed to help people to understand easily what help is available from the NHS. The guidance also offers help to victims’ relatives, who can help people cope with the trauma which can follow an attack. “Whilst this type of criminal assault remains rare, the NHS is caring for an increasing number of people who have fallen victim to these cowardly attacks. “One moment of thoughtless violence can result in serious physical pain and mental trauma, which can involve months if not years of costly and specialist NHS treatment. Guidance is also available on the NHS Choices website.